Surf’s up! It’s an awesome day to catch some rays or waves or just enjoy the last long days of summer. Out here in Southern Cal we can enjoy a warm day at the beach all year but the sun feels different in the summer. I created this banner to celebrate the last summer beach days we have. 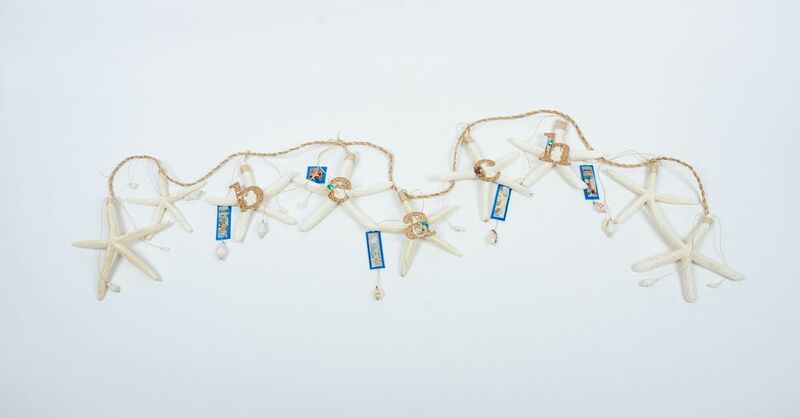 I started with an existing starfish garland. Then I altered it with glitter letters in sand colored glitter. Big grainy glitter. I altered the glittered letters with shells or a little bling. Then I added pictures of beach babes and seashells in those plastic, Tim Holtz bubbles that were so popular a few years ago. I taped them bubbles shut with shiny blue tape after I added 3-D embellishments and tiny seashells. I dangled a seashell from the bubbles. They added just the right amount of detail without taking away from the clean look of the beach banner.